What Is The Capital Of Malaysia? Kuala Lumpur is the official and royal capital of Malaysia, while Putrajaya is the administrative and judicial center of the country's government. The Malaysian Parliament building in the distance in Kuala Lumpur, Malaysia. Kuala Lumpur is the official and royal capital of Malaysia, and Putrajaya is the administrative and judicial center of the country. Malaysia is one of the countries in the world with multiple capital cities. Malaysia’s administration is divided into federal and state territories, where federal territories are governed by the national government while states are governed by their respective state governments. Malaysia is the only Southeast Asian country with a federal constitutional monarchy. Kuala Lumpur is sometimes referred to as the ‘Heart of Malaysia.' Located in Selangor State in the central west of Peninsular Malaysia, Kuala Lumpur is one of the federal territories in the country. Kuala Lumpur is home to the country’s Parliament and the official residence of the Malaysian King. Kuala Lumpur is the chief economic, transportation, cultural, and business center in Malaysia. Putrajaya is a planned city, the idea of which was developed by Malaysia’s fourth Prime Minister, Tun Dr. Mahathir Mohammad. The city was purposely created as an administrative capital to de-congest Kuala Lumpur. Since it is a planned city, Putrajaya prides in progressive infrastructure and a particular attention to environmental conservation. 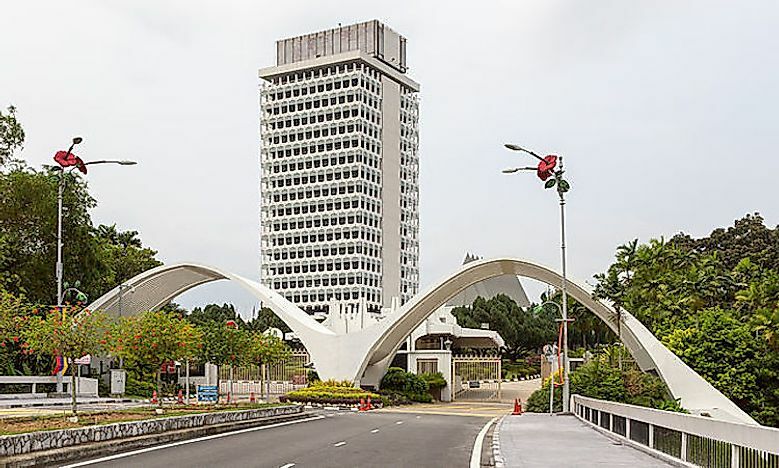 Putrajaya hosts nearly all of the government’s ministries, except the Ministry of Works, Ministry of International Trade and Industry, and Ministry of Defence which are situated in Kuala Lumpur. The city is home to the official residence of the Prime Minister and Deputy Prime Minister, the Melawati National Palace and the Supreme Court of Justice. Johor Bahru- located in southern Malaysia Johor Bahru is the state capital of Johor. Johor Bahru is also a bustling city in the south of Malaysia and it is one of the largest urban areas in Southeast Asia. Ipoh- Ipoh is the state capital of Perak and is one of the largest cities in Malaysia. The city is especially notable for its limestone caves and hills and mountain ranges. George Town- Penang State in Malaysia has its capital as George Town. A UNESCO World Heritage Site, George Town was one of the first British settlements in South-east Asia, founded in 1786 by a trader for the British East India Company named Captain Francis Light. Kangar- Kangar is the state capital of one of the smallest state in Malaysia, Perlis State. The capital has less than50, 000 inhabitants most of them are civil servants and farmers. Kota Kinabalu- Kota Kinabalu is the state capital of Sabah, situated on the northwest coast of Borneo Island. The city is the sixth largest urban area in the country and is an important commercial and industrial hub. Kuching- Kuching in addition to being the capital of Sarawak State it is also the fourth largest Malaysian city. Alor Setar- Alor Setar is an old city, having been founded in 1735. The city subsequently prides in a rich history, and it is the state capital of Kedah. Shah Alam- Shah Alam is the state capital of Selangor, and it the first city to be planned in independent Malaysia. Malacca City- Malacca City is the state capital of Malacca and a UNESCO World Heritage Site, being the oldest city in Malaysia situated on the Straits of Malacca. Kuantan- Kuantan is the capital of the Malaysian State of Pahang and is the ninth largest Malaysian city. Kota Bharu- Kota Bharu is located in northeastern Peninsular Malaysia, and it is the state capital of Kelantan. Seremban- the town of Seremban is the state capital of Negeri Sembilan. The town began as a mining center for tin ore and is a major commercial center in the state. Kuala Terengganu- Kuala Terengganu city is the state capital and chief commercial center of Terengganu. What Languages Are Spoken In Malaysia?